Hello, here is the card i made for a very special young man, my son. 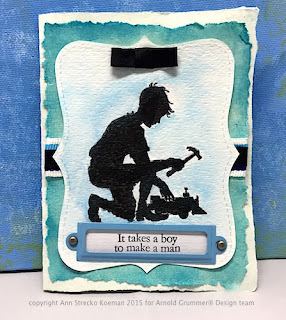 I am sharing it with you today as I know that examples of cards for men and boys are less common than those for women and girls. I decided to also share my project over at the Arnold Grummer Paper Making blog where I am on the Design Team. By following the link here you can see more details of how I made this card. I hope that you are inspired to make some masculine type cards too. Ranger Distress Ink "Broken China"
Luminarte Twinkling H2O's in Blue "Carribean Mist"